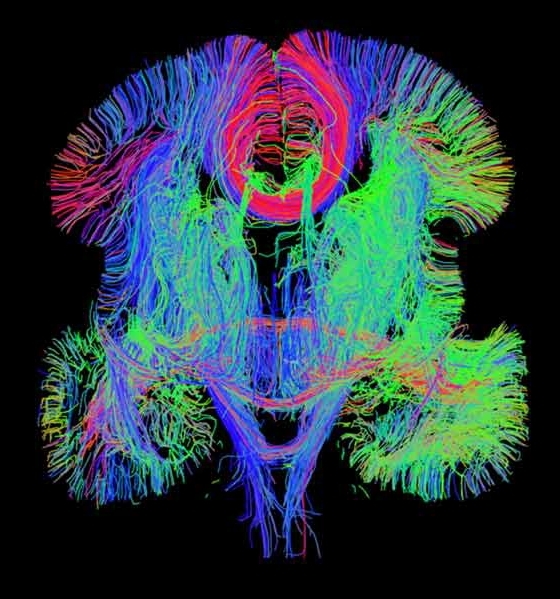 Caption: An image generated by whole-brain diffusion tensor tractography, one of a variety of innovative techniques used to create the 3-D gene expression atlas of the developing human brain. There is mounting evidence that predisposition to autism, schizophrenia, and many other devastating brain disorders may begin in the womb when genes are turned on or off at the wrong time during early brain development. But because our current maps of the developing brain are not nearly as detailed or dynamic as we would like, it has been a major challenge to identify and understand the precise roles of these genes. So, I’m pleased to report that NIH-funded researchers at the Allen Institute for Brain Science in Seattle have produced a comprehensive 3-D map that reveals the activity of some 20,000 genes in 300 brain regions during mid-prenatal development . While this is just the first installment of what will be an atlas of gene activity covering the entire course of human brain development, this rich trove of data is already transforming the way we think about neurodevelopmental disorders.